I received my undergraduate degree from Vanderbilt in 2017. I have a keen interest in genetics, which I pursued through undergraduate programs in molecular biology, neuroscience, and scientific computing. 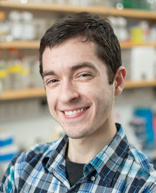 As a research fellow for the Searle Systems Biology and Bioengineering Undergraduate Research Experience (SyBBURE), I worked in the Hughey Lab to uncover links between the circadian clock and human cancer that may inform future therapies. My research primarily used statistical approaches to convert gene expression data from clinical tumor samples into quantitative readouts of how the clock is functioning in cancers of different types and stages. In addition, I applied these methods to other human diseases and developed mathematical models with the goal of understanding the connection between circadian clock function and various human phenotypes. I am currently working towards an advanced degree at the Wellcome Trust Sanger Institute in Cambridge, England, where I hope to continue research that applies genetics to understand disease and advance medicine.